Ready to discover peace even in the midst of your most difficult circumstances? Finding Peace in the Mess uses God's promises to take you on a 30-day journey of discovering how to let go of your pain and put your complete trust in Him, even in the messiest seasons of your life. You'll gain a real relationship with God, learn who you truly are in His Kingdom, and discover how to finally let go of what you can't control. BUY IT NOW FOR ONLY 14.95! Feeling beat down by everything life throws at you? 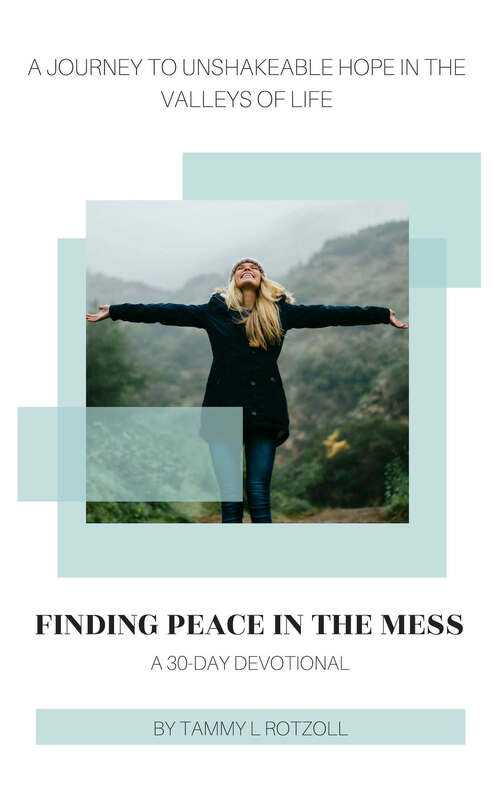 Finding Peace in the Mess shows you that you can find hope in any circumstance in your life, and that it is possible to experience both peace and pain at the very same time. Finding Peace in the Mess is written so that even on your busiest days, you can still discover who God is and all that He has promised you. Instant download so you can get started immediately! Download to your phone to have have access anywhere. Print it off and have it bound at your favorite office store. Or simply punch holes in it and put it in a 3-ring binder. Get automatic updates sent directly to your inbox. "A scar is merely proof that you are surviving, that you are succeeding, and most importantly, it is proof that God heals." I've believed in God as long as I can remember. However, it was only a short number of years ago that I found a relationship with Him, and it happened to be in one of the most difficult seasons of my life. Eight years ago, I was rocked out of the blue with a chronic illness that brought me to my knees physically, emotionally, and financially. I was sick, missing a lot of work, and didn't know where the money would come from to pay for gas, groceries or the rest of the bills. I found myself face-down in the mud of that valley floor and didn't have the strength, energy, or desire to keep going. I was scared, beat down, and exhausted. But God met me right where I was. He picked me up and taught me that despite everything I was going through, everything I was struggling with, I could still find true and complete peace. I could still experience joy in my life. He showed me that he could still use me, as broken as I was, for His purpose, and that my life was not over. Through my journey, I've learned how to stop worrying and start putting my trust in Him. I've learned to find happiness even on my darkest days. I'm completely honored that you're considering Finding Peace In The Mess. As founder and owner of Footprints of Inspiration, I'm extremely passionate about helping women find complete peace in the midst of their difficult journeys. I know what it's like to feel exhausted and miserable and how difficult it is to be completely strapped down by worry, but I found out firsthand what happens when you have a real relationship with God and how you can find complete freedom by relinquishing control and trusting Him in everything you do. 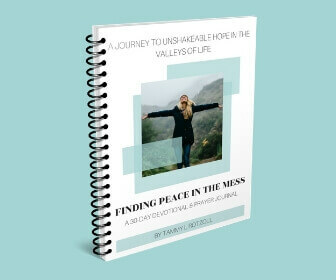 I created Finding Peace In The Mess to help women learn to trust in God and start enjoying life the way He intended. Prayer journal - A place to record what resonates with you each day and for writing your prayers to help you better connect with God in your journey. Begin and deepen your relationship with God. 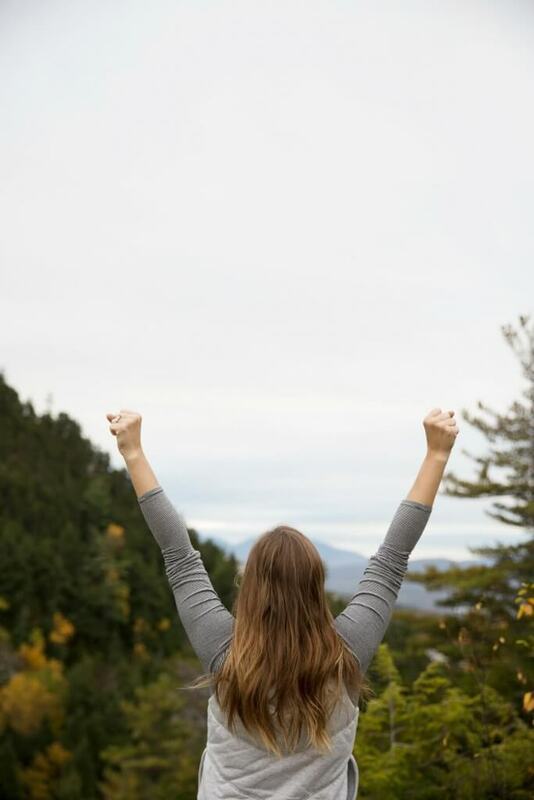 Find freedom from the pain, hurt, worry, self-doubt, and helplessness. Put your complete trust in Him. Find peace and complete joy no matter what challenges you are facing. "When your faith in God is bigger than your fear, the enemy has absolutely no power over you." Love, love, love, this devotional. Originally purchased as an immediate download from the author's site, but couldn't wait to get it on Kindle so I can keep it in my library for when I'm on the go. If you struggle with spending some quiet time with God, this 30-devotional will get you a nice jump start. Each day is filled with a thought provoking truth that inspires you to draw closer to Him in the MESS. Our family had just moved, I stopped working and was staying home for the first time, my husband was starting a new job, and we just introduced Baby #3 in four years!!! I felt like I had lost my identity. I was a MESS!!! This devotional jump started my journey to Peace!!! I cried, laughed, got angry and felt peace for the first time in a long time! This devotional was just what my soul needed! 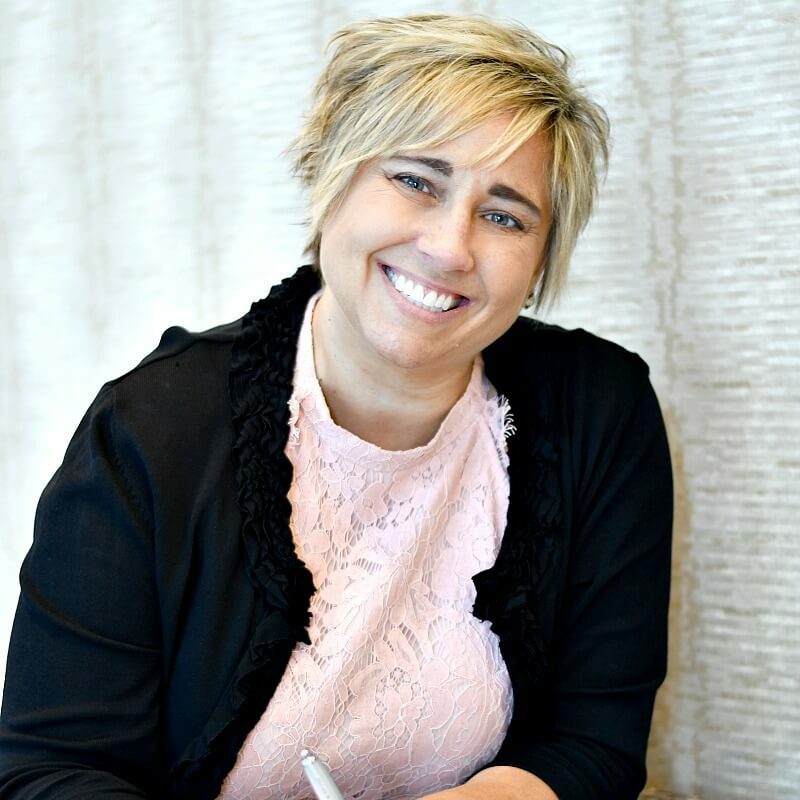 Author, Tammy Rotzoll, understands how important it is to turn to the Lord in a time of struggle and in the mess! She also knows that during these difficult journeys, our time can be limited and our ability to focus an additional challenge. She answered that with the perfect balance in her 30 day devotional that encourages you to hope. Each day is a small devotional with a bible verse. And, she includes a section entitled A Deeper Look. 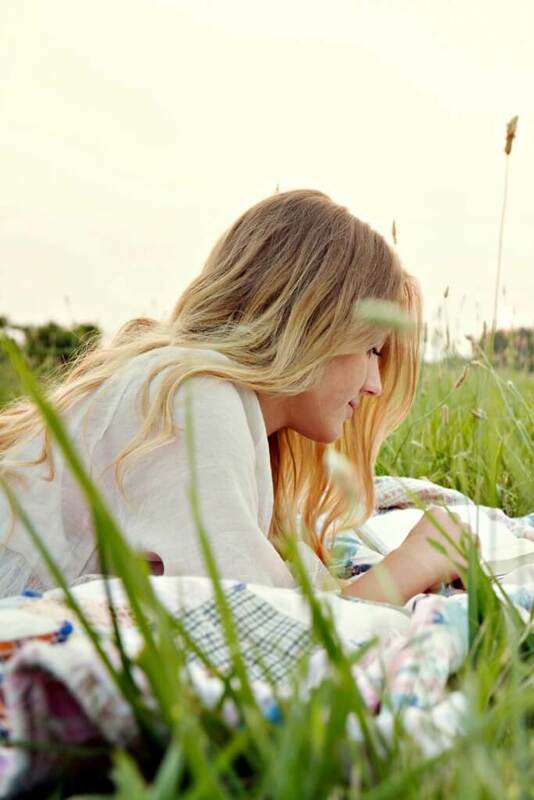 Here you can go back and read additional bible verses to help you draw into the Lord. I also love that in the devotional is included small, practical things you can do each day to focus on the Lord. You're not able to let go of the struggles and enjoy the life God created your for. You have or are going through difficult challenges in your life and live in a constant state of pain, worry, fear, and hopelessness. You're short on time but still crave a deeper relationship with God. What if I'm unhappy with the devotional? It's important to us that you're happy with your purchase. Therefore, if you are not completely satisfied in your journey within 30 days from purchasing it, you will receive a 100% money back guarantee. What If I'm short on time? Finding Peace in the Mess is written with your hectic schedule in mind, and will only take a few minutes each day. What translations are referenced in this devotional? All scripture quoted throughout the devotional come from the New Living Translation.